Do you have what it takes to be a rock star? One must only read this book to find out. So You Want to Be a Rock Star is a tyke's how-to guide and checklist of whether or not you really have it in you. Can you really handle the adoring fans, the endless rehearsals, and better yet, can you manage the rock-n-roll sneer? With the same humor and sass of her hilarious Buffalo books (Is Your Buffalo Ready for Kindergarten? 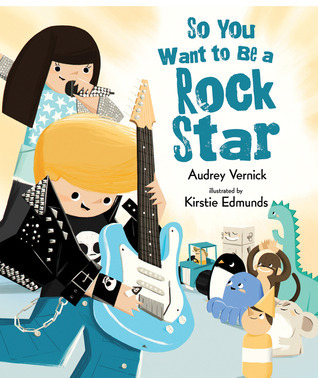 and Teach Your Buffalo to Play Drums), So You Want to Be a Rock Star is one of those books that manages to appeal to a wide range of ages: from pre-school student to Dead Head. And to me, that is the mark of a brilliant writer: one that can transcend age groups. One might assume that I give Audrey's books such high praise because she has been so generous to me and my students, sharing her time and talents with us, and for this reason, I might perhaps be a little biased. But, I loved Audrey's books before my students and I came to know her and I find myself so lucky to say that my favorite picture book author is as gracious as she is talented. Her style of writing just speaks to me in a way that no other picture book author does. Newcomer illustrator Kristie Edmunds not only enhances the humor of this picture book, but also helps to keep the story flowing, interesting, and exciting. I look forward to seeing great things from her in the future.